Google My Business/Google Places Google My Business is one of the easiest ways to show up in Google SERP, and very effective for local businesses. The benefits of Google My Business are that you will instantly see your business with photos, contact information and operating hours as you can add photos yourself. Here you can learn what others have to say about your business and can give you a rating. How to rank Google My Business. Trusted review sites use real customers and clients to give the star rating so make sure to use review sites that are trusted by Google. To get reviews you can implement star rating strategies & campaigns to get your customers/clients to give you a good review & rating. Once everything is in place, notify Google about all the reviews and ratings you have by using Schema markup. What is Schema Markup? From this point onwards it is up to Google to decide which sites (reviews & ratings) to show. Studies show that sites with higher authority are more likely to get the reviews’ 7 star ratings to show up in Google SERP. So get busy improving your website’s authority by creating great relevant content, reach out with the content and make sure your website is accessible to all web crawlers. Improve your Domain Authority by following these 9 simple steps to increase authority. Social Media/Profiles Social Media is a great way to show up in Google SERP. Not only are you reaching your audience on Social Platforms, but you can show up in organic listings. A lot of branded searches are showing up at the bottom of search results and tend to be from the brand’s social channels. If you qualify for a Wikipedia page you have a great chance of showing up frequently at the top. Using a Social Channel such as Pinterest can also make you rank for your brand’s images. Twitter Feed –“ Real-time tweets now appear in search results for brands & personalities. Structured Data Structured data can produce rich results in Google Search. If Google understands the content of your page and, in some circumstances, if you explicitly provide additional information in the page code using structured data. In addition to single rich results (previously known as rich cards), host lists can feature a carousel from a single site. 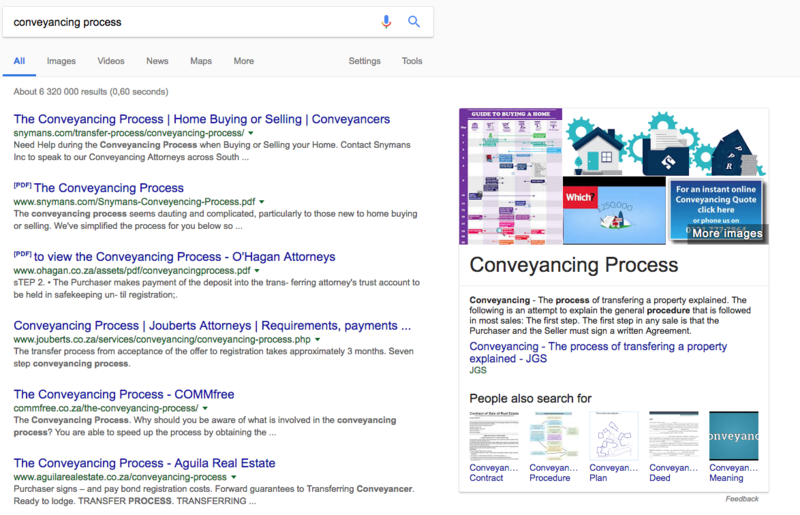 By adding structured data markup to your site, you can enable more of your site’s functional and visual elements to appear directly in search results and in Knowledge Graph cards. Read More about Structured Data. 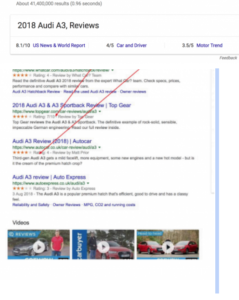 Additionally when you rank high enough, Google will collect snippets from the top few sources that are rich in valuable information in order to create a brief summary of snippets at the top of the SERP, as shown below for the Audi Result. 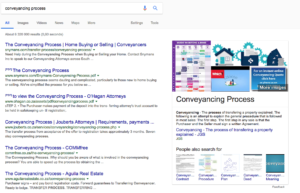 Or Google gathers information from multiple pages and creates a summary with images from multiple weboages, below for the term ‘Conyeyancing Process’. The above mentioned is just the tip of the Iceberg of the many ways to get listed in Google’s SERP. SEO is not limited to just ranking your website, but to increase the chances of showing up in Google’s search result pages. More visibility means more brand exposure, and more clicks to your social media, directory pages etc, where you can direct them to your website, or have CTA’s on those pages. I love the approach. At the end of the day don’t just look at outreach as a backlink builder, but use it to claim your spot in Search Results as well.